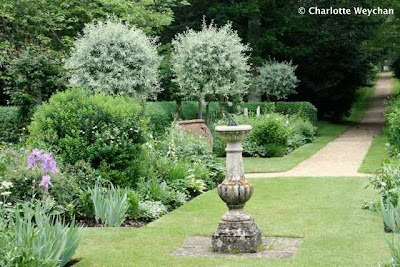 I've seen many beautiful gardens in the last few weeks and had wonderful days gazing at glorious flower displays in historic gardens like Barnsley; admired Elizabethan splendour at St Mary's Bramber; and ogled at topiary displays and unusual plants in microclimates around the UK at Veddw and Ventnor. But when I finally made it to Buscot Park (which has long been on my wish list) and the landscape unfolded before me, I was truly delighted. This is an extraordinary property, with heart-stopping vistas (right) - administered by Lord Faringdon and housing an extremely fine art collection. 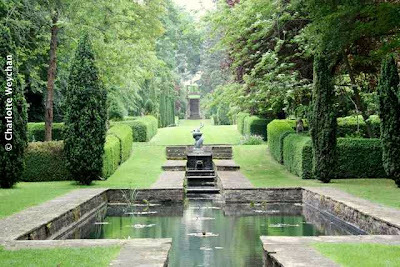 Buscot overlooks a lake and Harold Peto of Iford Manor created an amazing stepped-canal water garden (top) which runs from just below the main house, opens out into a series of pools, with bridges and statues, and enclosed by neatly trimmed box hedges. The box effect is reflected at the rear of the property (right) where a steep hillside walk gives views over the gardens behind the house. 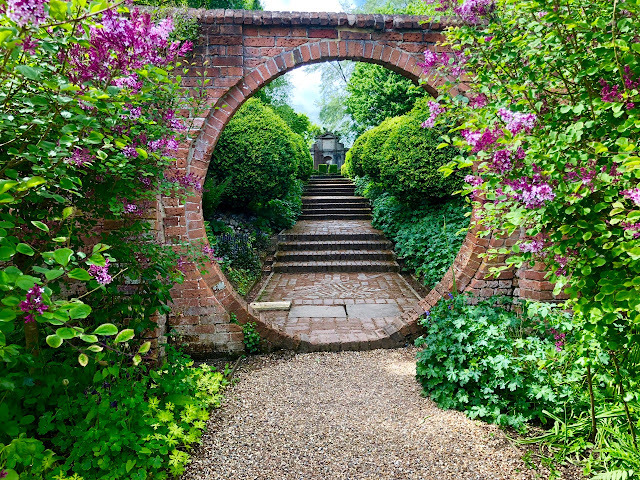 The large walled kitchen garden was rearranged in the 1980s and has wonderful borders and a Judas tree tunnel - stunning when the alliums are out! There are also a series of garden rooms adjacent to the water garden, where you'll find subtle planting in muted colours (below). 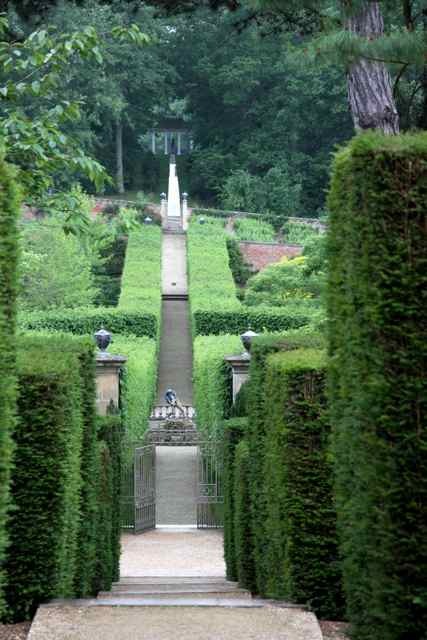 The estate extends to 150 acres, so allow plenty of time here because there's much to see and you don't want to miss anything. 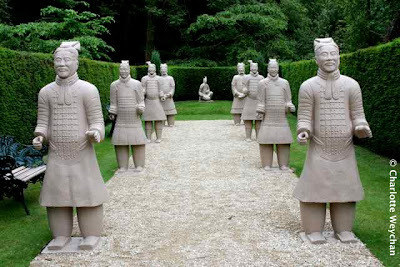 And don't miss the Chinese terracotta warrior collection (below) - 17 life-sized statues in the garden, acquired fairly recently by Buscot Park. 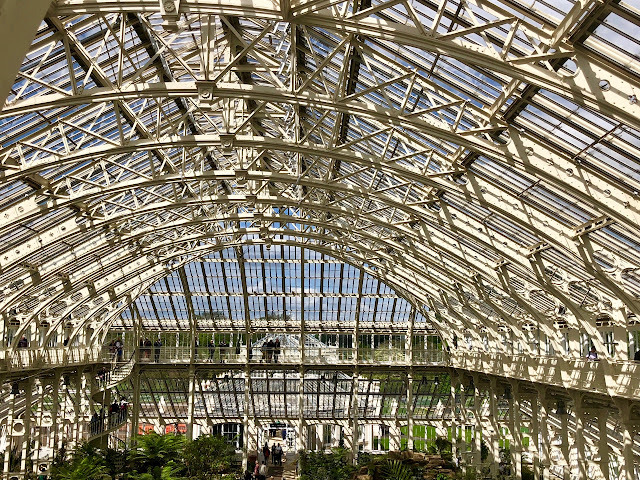 But DO check the website for opening times, because they change according to the season and you don't want to get there and find the gardens closed. Apologies to readers if the colours here are a little muted, but the weather was awful when I visited! Charlotte, I like the flat tones - when I was looking at the photos thought how much better it all looked on that cloudy day. You can really see the edges and forms so well. Thanks for the tour. Beautiful garden! and I was totally surprised to see Chinese terracotta warrior collection in this garden, very special! thank you for your excellent tour of Buscot Park, i was wondering what it would be like to walk along the path through the group of terracotta warriors on a foggy day in autumn, kind of spooky? You must have been there on Friday as I was - absolutely agree, one of the best and bookmarked to return on a better day!